I'm so glad that I took Morgan's advice and made Sizzle in medium. At the time she suggested it, the idea was that I would shrink into it. I haven't checked the guage lately (was right on with my swatch) but Sizzle fits now. 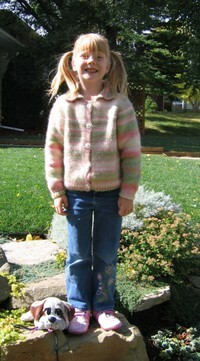 If I knit this again, and I might, I would make it about 2"longer. Probably I would do this by knitting up 6" instead of the 4" called for before starting the dart decreases. I may also knit an extra couple of rows between the end of the decrease dart and the start of the increase dart. What do you think? Does Sizzle hit or miss? Thank you so much for your supportive comments and emails. School start up this year has been extremely challenging for all of the teachers at my junior high school, but particularly difficult for me. There have been many changes in the structure of the school due to students from one community being reassigned to a different school. Many years of subtle changes in special education have seemingly culminated in my classroom this year. Rest assured that I continue to scream blue murder to all and sundry and the powers that be have heard the noise. On to fun stuff!! I finished #3's Neck Down Raglan and have the pictures to prove it. Hits: Very easy, well written, pattern with clear explanations perfect for beginners. Seemless constuction makes for a fast knit and a fast finish. Patons SWS is very soft with a lovely halo; warm without being heavy or scratchy. The colourway is gorgeous. #3 slept in this sweater for the first 3 nights! Misses: Patons SWS pils something fierce! 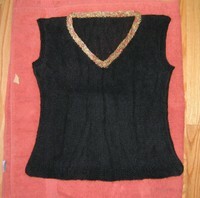 Dreadlocks had formed on the sleeves by the second day of wear. I kind of wish I had worked a little harder to match the striping on the sleeves. Not that anyone but me would notice or care about that. My Darling has finally settled on his heart's desire. 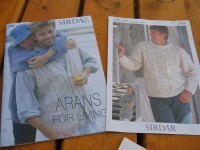 He wants an Aran sweater vest, with buttons. The pattern on the left met with his approval. Of course, I don't have anything in the stash that will work for this pattern. I have bulky wool for another kid sweater/hat, sock yarn, and laceweight. Believe it or not, there is not a scrap of worsted weight left in the bins. Oh Darn! Now I have to go buy yarn. Damn. I hate that too! I was in Edmonton yesterday and was pointed towards this little store. Ewe Asked For It (email link only)is a cute little store located at 6523 - 111 Street. This place is bright and cheery both inside and out. As I was toodling through the neighbourhood and noticed the little mall I thought that if I was a yarn store, that's where I would want to live and sure enough.... They were in the midst of preparations for a Fall Sale on Saturday, October 7 (everything in the store 25% off!) and getting flyers out for their classes. If you are in Edmonton, this little store is worth the wander through the neighbourhood. Of course they set me up with a little fiber goodness to take home. On the left is a lovely batt of roving prepared by Custom Woolen Mills which will be part of my SpinRoveSwap pal's package. I love this little mill. They use exclusively antique machinery to process wool from three bags full to finished yarn and stop anywhere in between. 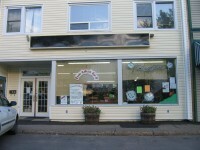 They also make wool batt quilts and socks knit on antique sock knitting machines. Extremely cool! Take the detour there on your way to Edmonton. Also in the pile is one skein of Manos Del Uruguay kettle dyed pure wool, colour 104 (earthy rusty reds and oranges) which will become a quick scarf. 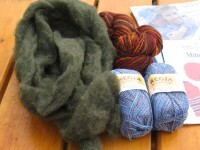 Of course, I can't resist sock yarn, especially when it's Regia BAMBOO (45% Bamboo, 40% superwash wool, 15% polyamide) in colour 1061 ( shades of blues, grey, black) I think it will look quite jeansy when knit up. This is some kind of sock yarn too - very soft and smooshy. I'm thinking wood needles for this yarn because of the slipperyness of bamboo. Some readers have been asking about my Denise needles. Much to my surprise after I wrote a post basically saying how much I don't like them, someone offered to buy them! I was happy to put them in the post this past week. My de-stashing has been very successful. I'm down to some acrylic sport weight stuff that would be awesome for baby blankets or afghans for little girls, or baby sweater / layette sets. I'm looking forward to seeing my ex-stash on your blogs as WIPs and FOs. Sizzle is nearing completion. I'm ready to graft the shoulders, seam the sides, and knit the bands. Design work on the Sizzle Bolero needs to start in earnest now. Short post, dear reader, just so you know that I haven't spontaneously combusted. I have been knitting a bit. I finished a pair of Fetching gloves in olive green DB Cashmerino Aran. I plan on a second pair in coffee bean Elann Peruvian Highland Wool. I have also been concentrating on Sizzle quite a bit. Plain stocking stitch is about all I can manage at night. I'm just past the armhole decreases on the front, so it shouldn't be too much longer. 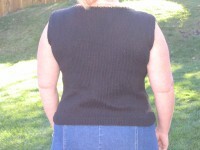 I also finished #3's Neck Down Raglan Cardigan in Paton's SWS. I have pics, but they will have to wait for a time I'm not falling asleep. A note about the SWS - it pils something fierce. Should have expected it because of the fuzzy halo and very soft spin but still, nasty, big, dreadlocks. In the works, a bolero to match Sizzle. Pattern of my own, which I will share if it works and if you want. I haven't forgotten about the pocket tutorial either - still there but on the backburner. Email me if you're burning with the desire to insert a pocket into something and I'll tell you how to do it. I heard from my SpinRoveSwap pal today. Bless her, she's almost got a package ready to mail to me!I have been thinking lots about what I'll get my partner but it has to wait until after payday. I finished spinning my giant batt of wool from Twist of Fate. Miles of singles sitting on spindles now. Must figure out how to make an "andean plying bracelet" so that I can teach myself how to "navajo ply". My tagline is, "Whenever two knitters meet, they find a friend." On Saturday, I found a friend! I met up with Marnie at Make 1. 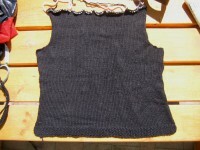 A little while ago Marnie posted on her blog about how she really didn't like seaming. I sent her an email and offered to do it for her. I used to hate seaming too. My Mom had shown me how to do an overcast seam and that was the only thing I did for like 30+ years. About a year ago I followed some picture directions and learned how to do mattress stitch. DING!!! Seaming became fun. I love the way you can sew / weave your needle through an inch of stitches, then pull it snug and watch the seam line disappear. Anyway, Marnie and I sat down together and in no time had one side seamed. She did the other side herself, with very little coaching! Go visit Marnie and Ginger the Dachsie and see her brand new, first ever finished garment!! Way to go Marnie!! 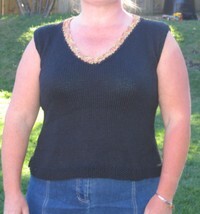 I finished Claire's Neck-Down SoyWoolStripes cardigan today. It's soaking in the bath now, waiting to block. I still want to find some pretty buttons for it, but for now I guess I'll just put on some pink plastic buttons so that she can wear it. Concentrating next on Sizzle. It's been a while since I finished something for me. My Stash Busting sale continues. If you see something in the album that you're interested in please feel free to make me an offer. I'm open to negotiation. I noticed that I am very rapidly approaching 9000 visits. The 9000th visitor to this blog will be offered the opportunity to choose whatever their heart desires from the sale album, at no charge. Visit daily, visit often. In the meantime, have a great week, and remember to be kind to yourself every day. Holly and Charity have been the first to take advantage of my Stash Reduction Sale. Charity correctly points out that I am reducing my stash, but she is in fact enhancing hers. If you prefer to think of it as a Stash Enhancement Sale, go for it. Look for pictures and information in the photo album in the right hand column creatively titled, "Stash Reduction Sale". Email me with requests to buy or any questions. You can use the link at the bottom right, or dohertyg (at) telus (dot) net Whichever. STASH REDUCTION SALE NOW ON! Rather than spend hours in a post uploading pictures one at a time, and then the rigamarole of keeping it updated, I have decided to use a photo album. Look down the left side.....keep going......at the bottom.....got it? STASH REDUCTION SALE Click on the photo album. You will see a page with thumbnails showing the selection. Click on a thumbnail to see a larger image and description of the yarn in question along with my asking price. I've never done this before, so I'm using the garage sale price setting method: would I consider paying that amount for that item? Yes, I am open to negotiation, within reason, but I do think everything is a pretty good deal. There are some freebies as well, so if you are going to make a purchase you need to ask for the freebie. In the event that 2 of you want the same yarn, the earlier timestamp will be honored. I will ship your stash enhancement to you asap, using regular Canada Post. Delivery should be 2 weeks or less. Generally, postage to US and Canada will be in the C$10 range, so that is what I will charge you. If you want a tracking number, I will let you know the exact cost of shipping, and ask you to pay for that. I will be happy to cram as much yarn into the smallest possible box as I can! Each purchase will also come with a special surprise gift from me. At your end, please write me a check for your purchase, plus C$10.00 shipping and drop it in the mail. I trust you. Local Calgary Knitters - I will be happy to meet you at your favourite LYS / Timmy's / bar to deliver your yarn in person and do a little Knitting in Public. Any Questions? Want to buy something(s)? Email me: dohertyg (at) telus (dot) net and let me know how I can enhance your stash. 1) How long have you been spinning? I took my first drop spindle class in July - so, about 6 weeks or so. 2) Are you a beginner, novice, or experienced spinner? Beginner, definitely a beginner. 4) What types and weights of drop spindles (or what type of spinning wheel(s) ) do you currently own? I have 4 drop spindles: a bottom whorl Russian spindle from Peace Fleece, the top whorl student Ashford spindle I got at my class, the drop dead gorgeous perfectly balanced top whorl my KSKS pal sent me, and a hand carved top whorl made of soapstone which is unbelievably heavy. 6) What fibers do you prefer to spin with? I've enjoyed both the silk and the wool. Not really experienced enough to have a definite preference. 7) What fibers do you dislike? I love all natural fibers - plant or animal based. 8) Do you prefer natural colored fibers, or handpainted/dyed fiber? I love the way that handpainted / dyed fibers change when I spin them. It's endlessley fascinating to me, kind of like self striping sock yarn. 9) Would you prefer all one type of roving or smaller amounts of different types to sample? I think I'd like only one or two types of fiber to try to spin with. That way I get enough practice with it that I can feel I've learned a skill. 12) What would you like to do with your handspun yarn, or what do you plan to do with it? (pattern clarification here) I would like to be able to make something wearable - maybe a pair of fingerless gloves? or a lace scarf? 13) What spinning projects are you currently working on? Practicing on my Romney with my KSKS spindle. When I have enough spun, I'm going to ply it with the single I spun on my Russian spindle just for the heck of it. 14) Do you have a wishlist? I would love to have a good resource book on handspinning. 17) What is your preferred shipping method (USPS, UPS, FedEx)? Whatever you like, they all come to Canada. The Best Idea in the World!! Remember my Rant about how much I hate slippery ribbon yarns put up on hollow cardboard cores? I have seen the soloution!!! It's BRILLIANT! Ask me how much I love this idea. Go on. Ask me. I love this idea more than I love Tim Horton's coffee. That's a lot. Gotta go get a free standing TP holder. And take pictures for the Stash Reduction Sale, which starts tomorrow! I spent a glorious afternoon yesterday at a water park with Hubby Darling and the kiddos. I finished the back of Sizzle, got a sunburn, and loved every minute! Your first look at Sizzle. Black MistiCotton (pima/silk) Nice shine, nice hand, hope it doesn't pill. Saturday, September 3, 2006. The only cloud is a con trail from a passing jet. I included it so you wouldn't think I was trying to pass off a colour chip as a picture of the sky over Calgary. 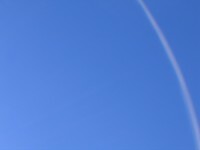 Summer Sky Blue ... Blue so Blue it almost hurts ... What fiber or weight would you make Summer Sky Blue? ... What would you knit with Summer Sky Blue? Stay tuned next week for Stash Reduction Time!!! I recently had to go through the stash and repack it into bigger plastic bins. Hubby Darling and I are considering selling and moving, so stash reduction is necessary. I'll post pictures of lots, with all available info on the yarn, and a price which will be about 50% or less of whatever I paid. After all, it has been marinating a while. Shipping will be about C$10.00 in US or Canada. Honour system. I'll ship you the yarn and trust that you'll send me the check. If you're local, I'd love to meet for Coffee and Knitting Time, and happy to deliver your stash enhancement.